Compatible with Apple Pay, Google Pay, and Samsung Pay – Use your mobile device to pay at millions of retailers throughout the country. Learn more. 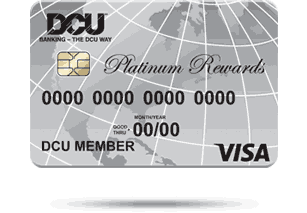 DCU Visa Platinum Rewards is rated 4.2 out of 5 by 108. Rated 5 out of 5 by Dheeraj Patta from Awesome Credit limit to Members. Quick and Hassle free DCU does a great job of presenting pre-approved and qualified offers to Members. Accepted a pre approved offer for DCU Platinum Rewards and instantly see the Credit added to my Account. Literally everything done in less than 10 mins. No Credit Pull, No additional documents, no customer care calls. Highly recommend DCU ! Rated 5 out of 5 by MMW from Easiest process to apply for card We applied over the phone and got an approval while we waited. Entire process took about 15 minutes. I appreciated that DCU requires the co-applicant to be present understanding that this cuts down on fraudulent applications. Rated 5 out of 5 by Teach from Great so far I just got the card, so I can't really say much else about it except it was very easy to apply, has a quite reasonable rate and was approved quickly. If the card is as good as all of DCU's other services, I know I will love it. Thank you, DCU! Rated 5 out of 5 by Perkenson from I don't have world to explain For me DCU is the best one, thank you for you service DCU you make my life better right now, thanks. Rated 5 out of 5 by Matt from Good card and even better service! Good rewards structure, great APR rate and site is easy to navigate to manage your card and other accounts. The free Equifax FICO score every month is a nice bonus to have as well. The approval process was very straight forward and Emily went above and beyond to answer all my questions this week. Outstanding service! Two thumbs up for DCU. Rated 5 out of 5 by Cynthia from Great product The process to get this card was simple and the benefits are great. What happened to any points that DCU credit card holders had with the old Scorecard rewards program? I'll admit that I rarely used them, preferring to let them build up for a big purchase. But when I went to check on them several months ago, I noticed that there was now a special card that earned rewards points. It seems like the standard card no longer earns points with purchases. I checked with DCU and apparently, they discontinued this program in 2010 but the points can be transferred if you hold a DCU Rewards Platinum Visa. You will need to switch your existing card into that card and then transfer the points to that. Can I get a cash advance from my DCU Visa Credit Card at an ATM? https://www.dreampoints.com/dcurewards/ You will have to register separately for this. How long do I have to dispute a DCU Visa Credit or Check Card transaction? Transactions can be disputed 60 days from the date of the statement that shows the transaction in question. The dispute can be submitted in PC Branch under the &quot;Forms/Services&quot; link. How do I add an authorized user to my DCU Visa Credit Card? You can add an authorized user to your DCU Visa Credit Card account with our Authorized User Form.